Comfort and care for your skin with the Eucerin Dry Skin Replenishing Face Cream, a daily moisturiser that eases the discomfort of very dry and tight complexions. Created to provide daily comfort, this rich cream cocoons skin in softness, offering long-lasting support for complexions that are reactive and dried out. Its 5% concentration of urea binds moisture to the skin to replenish its natural moisture reserves, while the fragrance-free and colourant-free formulation minimises the risk of skin irritation and allergies. After use, the skin feels calmed, with a smoother and more supple appearance. Though rich, the cream is easily absorbed and is makes a great make-up base or after shave balm. Apply the Replenishing Face Cream each morning to the face and neck after cleansing. Massage until the cream is completely absorbed. Avoid direct contact with eyes. 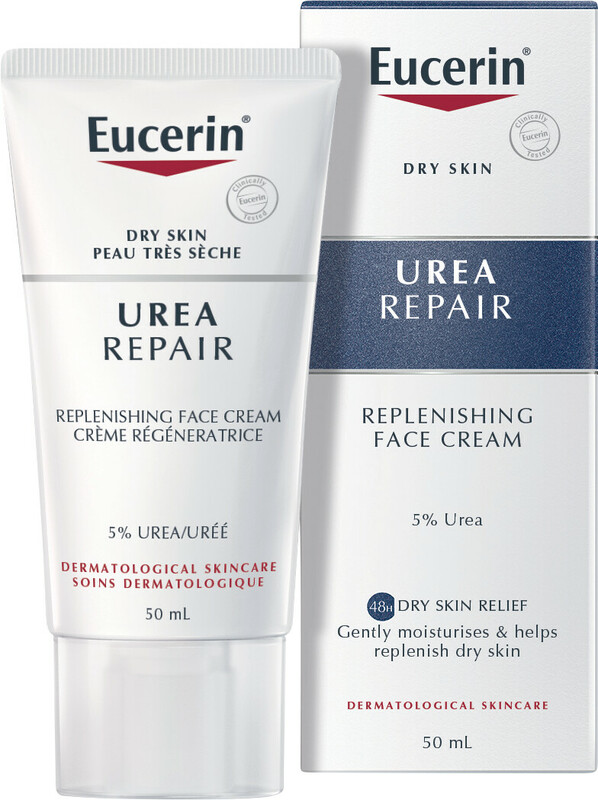 Eucerin Dry Skin Replenishing Face Cream - 5% Urea 50ml is rated 4.5 out of 5 by 4. Rated 5 out of 5 by Bambi13 from Best moisturiser for dehydrated/dry skin I've been on the search for a decent daily moisturiser for years for my fussy skin and I think this might be my holy grail moisturiser! My skin is normal to a little dry, and dehydrated - but it doesn't like rich/heavy moisturisers and lighter ones don't usually feel moisturising enough. This was recommended to me by a friend and I'm so impressed with it. It's full of hydrating ingredients, you don't need much at all and it makes my skin feel smooth and nourished without a greasy feel. I appreciate the lack of fragrance in it too as I find it unnecessary in this type of skincare product. I started using this day and night in the winter when my skin was suffering (from the cold + retinoid use), sometimes adding a drop of face oil for extra nourishment, but I'm using it alone now and it's still perfect. I just hope they never reformulate it as it's awesome as it is - definite repurchase! This is a great option for normal to dry skin but I also think it would be light enough for combination skin that's dehydrated due to its light texture. Also great for sensitive skin as there are no irritating ingredients in the formulation. Rated 3 out of 5 by Inamarlene from Not the best for very dry/hydrated skin I bought this for my boyfriend who suffers from tight, itchy and irritated skin after shaving or hot showers. It didn't work as expected, but after using a different product to hydrate the skin, he went back to it and it works better. Would recommend it to someone who needs light hydration/ normal to combination skin types. It was also a bit hard to work with as it dried too quickly. Rated 5 out of 5 by tamsin63 from Best cream ever This no frills moisturiser is the best thing I've ever tried. I've used high end, high price products from Gatineau, Elemis etc and this beats them all and for a fifth of the price. Delivers fabulous long lasting moisture without resulting in breakouts or flaky skin. I've been using this for a couple of years now and it has never let me down.I love this product! Give it a go. Rated 5 out of 5 by Beth11 from A little goes a long way Having tried numerous products over the years nothing prevented my face from turning into a red, flakey mess until I found Eucerin. Within 3 days I realised this is what I'd been looking for. The cream is so light, fragrance free and doesn't leave you with a greasy film over your face. No problem applying make up over it but my face looks so much better I'm no longer afraid to go out make up free! Yes it's not the cheapest moisturiser around but for me it's a small price to pay to feel comfortable in my skin at last.